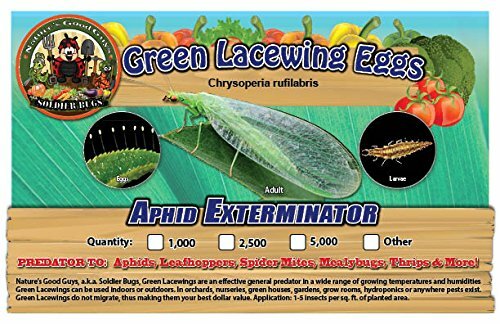 Predator to: Aphids, Leafhoppers, Spider Mites, Mealybugs, Thrips, Whiteflies and other soft bodied insects. Nature's Good Guys, a.k.a Soldier Bugs, Green Lacewings are an effective general predator in a wide range of growing temperatures and humidities. Green Lacewings can be used indoors or outdoors. In orchards, nurseries, green houses, gardens, grow rooms, hydroponics, or anywhere pests exist! Green lacewing do not migrate, thus making them your best dollar value. Application: 1-5 per sq.ft. of planted area. Description: lacewings eggs typically hatch within 5 days, depending on the temperature. It has been noted by our experienced farmers that the lacewing larvae can consume up to 600 aphids during their larva stage. Lacewing larvae attack; several species of aphids, spider mites, thrips, whiteflies, mealybugs, small caterpillars, beetle larva. As well as the eggs of leafhoppers, moths, and leafminers, small caterpillars and beetle larva. The lacewing larvae live 15-20 days, pupate and become an adult for 2 months. While an adult the lacewings fly around and lay eggs near infested plants. The adults only feed on pollen. Note: You can release lacewings with other beneficial insects like ladybugs and praying mantis!! We recommend releasing the same day as received. Release Rates: Interiorscape: 1,000 eggs per 500 sq. feet; Gardens: 1,000 eggs per 2,500 sq. feet; Field Crops: 5,000 per acre. 2500 Live Green Lacewing Eggs - A Great General Pest Predator! It is like having your own garden Air Force! Each green lacewing larvae can consume up to 600 aphids in their larvae stage! If you have any questions about this product by Bug Sales, contact us by completing and submitting the form below. If you are looking for a specif part number, please include it with your message.